This week I visited the Carlow Brewing Company (better known as O'Hara's) to meet the eponymous Seamus O'Hara, and Jack O'Shea of Alltech, a global biotech company. Last August Irish whiskey fans were surprised by the announcement that Alltech had just shipped new whiskey stills from the US for installation at the brewery. From my chat with Jack and Seamus, I get the impression that even those involved were surprised by just how quickly it all came about. The first spirit trickled from the stills in Carlow on November 1st, 2012, not six months after the first meeting between Seamus and Alltech's founder, Dr Pearse Lyons. The brisk commissioning of the Alltech / Carlow Brewing Company joint venture (so brisk that they haven't paused to come up with a catchier name) was facilitated by the availability of much of the required kit on site. The malt can be mashed and fermented by the brewery so not much else was required beyond a couple of stills and receiver vessels, and the piping to connect them. Nothing is automated; it is truly a craft operation. So far, production is fairly conventional. The mash is all malted barley, and that barley is the distiller's variety, not the brewer's. The spirit is double distilled and filled into ex-bourbon casks that Alltech supplies from its distillery in Kentucky. It's then shipped off to a bonded warehouse to mature quietly. It's already a five-day-a-week routine that will ensure a decent volume of single malt whiskey a few years down the road. 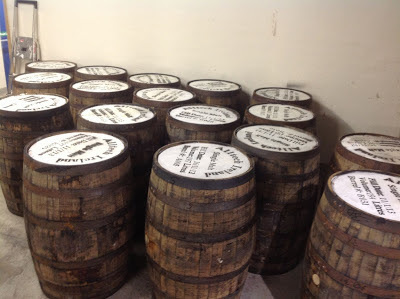 Filled ex-bourbon casks. Photo courtesy of Alltech / Carlow Brewing Co. I expect convention to yield to experimentation soon though. Distillers are typically conservative with their mash recipes. Bushmills' brief dalliance with crystal malt a few years ago was a notable exception. Brewers are far more broad-minded when it comes to grain. To look at it another way, what makes this new distillery unique in Ireland is that it's attached to an innovative craft brewery. It's unthinkable that we would never see that reflected in the distillery output. The distillery has one other unique feature, you can see it in the original press release from Alltech announcing the distillery. That's the spirit still and it differs from the conventionally-shaped wash still in having a rectifying column in place of the swan neck. I'm not familiar with its operation but apparently it offers enhanced control over the type of distillate produced. 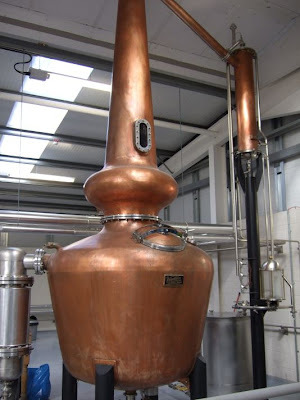 The use of such a still is not entirely unknown in these islands - Loch Lomond has four of them and Penderyn in Wales has another riff on the same concept. 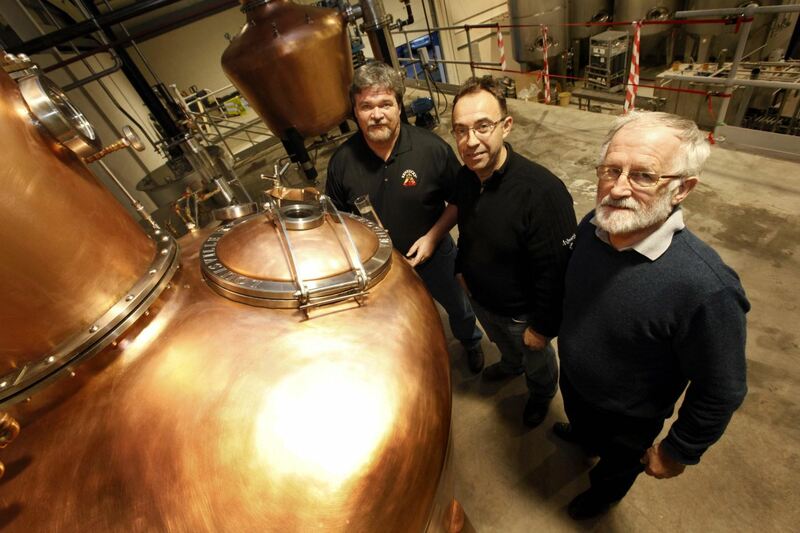 We are guaranteed a new Irish whiskey from Carlow in a few years' time. I think we are in for a few surprises too. (L-R) Mark Coffman from Alltech in the United States, Seamus O'Hara from Carlow Brewing Company and Jack O'Shea from Alltech Ireland, with the spirit still. Photo courtesy of Alltech / Carlow Brewing Co.